The sequel to DM-Vocant, VocantII acheives with a small pallet of textures and some brillant brush work the status of a very playable and enjoyable Deathmatch. Nicely trimmed and lit, the castlesque map has plenty of Z and is FPS friendly from the sewer to the roof tops. 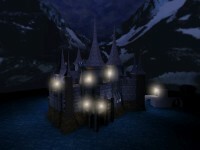 A well selected sound track accompies players as they frag with room to dodge in this Gothic stylized structure. My first beef would be with weapon placement being on the stingy side and not well marked. The Deemer and Ivisibility are well placed and bots are pathed to go everywhere and make the game challenging. Last, the entire map is more maze like than an actual place, that is, areas lack a defined place within the castle causing some confusion and a bit higher learning curve though some architectual clues are present if you stay alert. In conclusion, this here map has game. Better than most stock UT maps it is among the best user made maps I've had the pleasure to encounter. If you don't believe me, download it. Capable of higher player loads (with 'weapon stay') VocantII should be considered on any UT Deathmatch server list. It's never been reviewed here but, from the same author as DM-Hydrophobia, this is one of the prettiest maps ever made for UT. A huge fantasy castle map for 6-16 players that to me resembles a playable version of DM-Falkenstein. Players have full run of the place including the many roofs. I'd give it a higher score, but flow between the lower and upper levels is not brilliant. it's quite nice, but could do with more detail imo, it looks a bit plain... also, the blue lighting seems a bit overdone in places. More detail, yes yes, but that doesn't quite warrent demoting this map to a score of SIX. But more detail frequently means more polygons in view, slower frame rates, or too much buisiness in an area. The flow is good but could be better (more access to the rooftop area besides using the translocator, ONE lift, or jumpboots for instance). Vocant][ is still a nice castle map; I've seen others far more complex - too complex and too poorly pathed. This one's definately worth your time if ya like castles. A too large map, a nearly perfect castle. A super map. One of the best that I have the pleasure to play on. Good map for larger player loads, nice ideas, plenty of Z-Axis, one of the better maps for large loads. I have alway's love that map. It is a sure winner. Bravo! to the author super job.